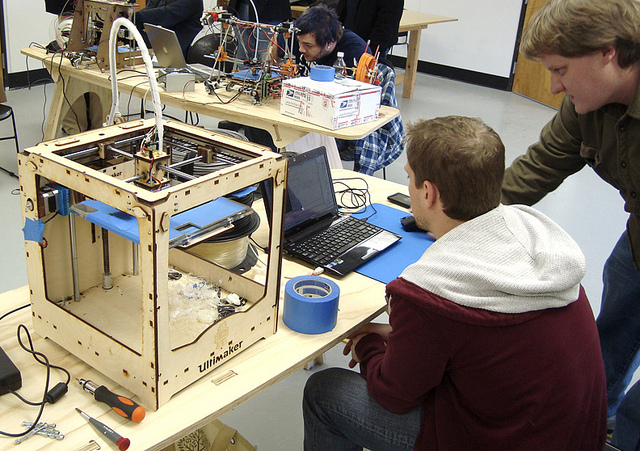 Do makerspaces serve people’s wants or people’s needs? Certainly the vast majority of these spaces exist because people want to work on projects, learn from one another, and have access to shared tools. However, there is a small subset whose purpose is to address the needs of a community. This is the story of one such makerspace and the business model they’d like to spread. Maker Works is a member-based studio located in Michigan, the heart of the rust belt, where making has been a tradition for a hundred years but where hard times have tested the region’s character. We all know the story of the past decades where manufacturing jobs moved overseas, companies closed plants, and the population went increasingly underemployed. Times have been tough. It is in this context that Tom Root and Dale Grover found themselves. As with many makerspaces, Maker Works grows out of regular meetups of like-minded geeks. The first was a weekly breakfast called Go-Tech. Established and run by Dale, it quickly grew into a once-per-month evening show-and-tell where members shared their joy of making by wheeling in CNC machines, wiring-up Arduinos, and more. Dale went onto join a work space for laptop people known as Workantile, a co-working space. Then with three friends he established a hybrid model, a co-work space for entrepreneurial engineers which is known as A2MechShop. Traveling a parallel course was Tom Root. The downturn of 2008 hit his mail order business hard but while he weathered the storm he saw that many wouldn’t. He was seized with a sense that he needed to do something to help others. Passionate about the value of making, he decided that a makerspace workshop could help address big issues: unemployment, reskilling, self-sustainability, environmental, and other concerns. 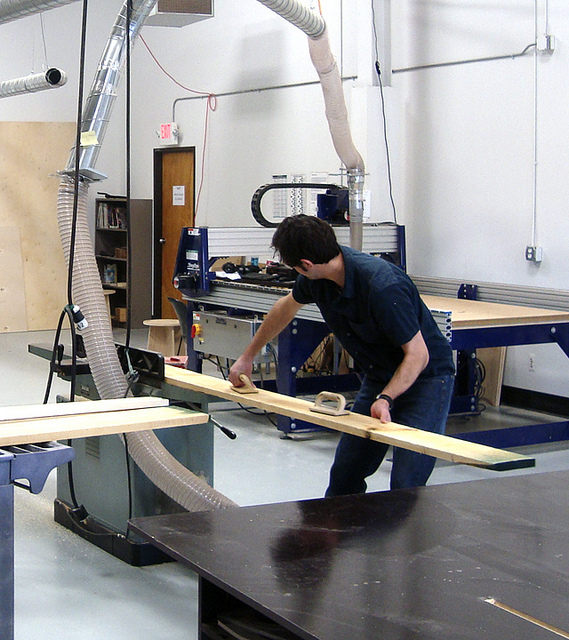 In 2008, after failing to entice TechShop to establish a local presence, he embarked on a path to build his own community workshop. Over the course of the next two years, Tom navigated the waters of Go-Tech, Workantile, and A2MechShop with Dale. They got to know each other, found they shared values, and developed a common vision. With the passage of time and increasing confidence, in 2010, they decided to take the leap to establish Maker Works. Now let’s get back to the story …It was early 2010. 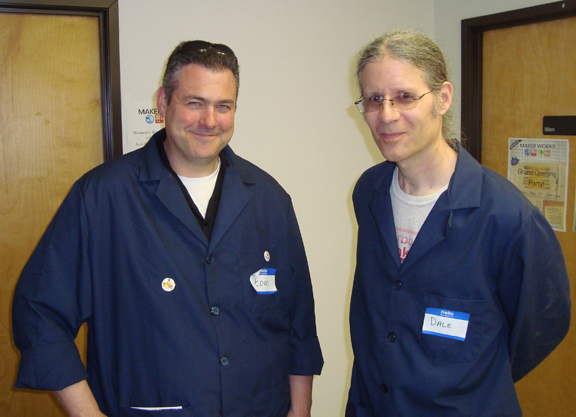 Dale and Tom had made the commitment to establish a socially responsible makerspace business to drive positive change. The countdown to launch had begun. By December they overcame a key obstacle; they found an insurer willing to underwrite the business. The next challenge was finding an appropriate space. Their initial goal was a 5,000 sq ft facility but they learned they really needed much more and eventually found an 11,000 sq ft facility near the Zingerman’s campus. Not only were the terms advantageous because of the Zingerman’s connection, but being close to Zingerman’s had many benefits. Maker Works could use Zingerman’s storage, borrow forklifts, buy at their stores, etc. while Zingerman’s could design and mill signs, build chairs, etc. at Maker Works. In February of 2011, Maker Works signed the lease. The makerspace business had a home! Preparing the space defined the next big push. Floors were carpeted and needed stripping, cleaning, and epoxy paint. Walls needed painting and there were so many walls! To quote Dale, it was “1640 linear feet of painted walls, but who’s counting? !” Electricity needed to be distributed throughout the building to where it would be needed. Thank god for Toni, Tom’s wife and partner! She wrangled all the vendors. The fathers of both Tom and Dale also deserve credit as they put in many hours building tables and more. Obviously, family was a key resource. Another key assist came from Karl Daubman, a professor at the University of Michigan. He is a principal at an architectural firm called Ply and is Chief Architect at a manufacturer of prefab homes named BLU Homes. He helped in a big way with permits, interior design, traffic flow planning, etc. Volunteers of friends and family were a big source of help in getting things done but nothing contributed quite so much as the sweat on the brows of Tom and Dale. Maker Works started paying rent in May of 2011. Paid staff came onboard in August. Their standard operating procedures were defined by September when they did a soft launch. Between then and May of 2012 they refined their operation and smoothed out the kinks. Then, after 18 months of hard work they held their grand opening on May 12, 2012. I had the pleasure of visiting Maker Works back in March. Going in, I didn’t know it would be such a pleasure; it was just a side trip of my daughter’s college visit to Ann Arbor. Frankly, we only hoped we’d find the space open and maybe get a tour. What we received was the undivided attention of Tom who gave us a tour, described his programs, and shared his vision. What we saw was a clean and fully fleshed out makerspace operating with a buzz of activity. One room was full of students actively working their FIRST Robotics entry. Another cavernous room had a woodworking project being milled on a full-size ShopBot. We couldn’t help but feel a pang of desire when we passed through the crafts area and saw their laser cutter, sewing and embroidery machines, and 3D printers. The tour went on and on revealing great resources. At one point, I noticed private offices and asked about them. Since the start, they’d had small businesses and entrepreneurs asking to rent space and they were able to quickly rent out all unallocated space, even the office that Tom and Dale shared. When the lease for A2MechShop ended in April, Maker Works expanded into the rest of their building and A2MechShop moved in. Toward the end, Tom paused at a whiteboard to share his vision. All that we had seen was for a purpose. It was a business because it had to be self-sustaining and for that reason needed to charge a reasonable monthly rate for makers who should pay. However, students and people needing employment would also be included through a formula of lower rates and a jobs board which listed projects needing work. It’s possible to earn credit for education and membership by cleaning, repairing, teaching, and otherwise benefiting Maker Works with other tasks. The idea is that everyone should be able to benefit from Maker Works regardless of means, to learn new skills, to increase self confidence, and to benefit the community. Dale and Tom are determined to include, not exclude, people to help them realize their vision to benefit the world. And just how do they see themselves benefiting the world? They want to serve three distinct communities: makers, students, and 1099s (unemployed, under-employed, self-employed, independent contractors etc.). Their goal is to build and maintain an environment that nurtures Education and Innovation which in the end benefit the world by delivering skilled workers, new businesses, and great products. Below is Tom’s diagram which summarizes the vision. So they’ve launched and they’re humming along. What next? Well, if one Maker Works can do good in Ann Arbor then additional Maker Works can do good in other areas. They’re interested in replicating the model in places with the need to bring training in modern fabrication and a workshop of tools to help with economic redevelopment. As Tom said to me, “Ann Arbor was a safe place for us to start but, in terms of impact, Downtown Detroit would be the ultimate. There are so many wonderful and committed people doing good there. It would be a dream come true to be a positive part of Detroit.” They’re looking for anyone interested in and able to apply their model of social entrepreneurialism to help solve problems. If you’d like to know more then visit their website: Maker-Works.com. Or, if you’re so lucky as to be in Ann Arbor then stop by. However, plan better than I did and call ahead. Many job hunters are downright frustrated. But one expert says it's not you, it's the employers and a flawed electronic application process that may be preventing qualified people from finding work. Host Michel Martin speaks with University of Pennsylvania's Peter Capelli. He's the author of Why Good People Can't Get Jobs. Developers at open-source nonprofit organization Linaro have posted a set of code tweaks for Android, enabling up to 100% increases in performance, compared to a vanilla version of Ice Cream Sandwich (Android 4.0). A video the group recently posted, from its Q2 event, appears to show the Linaro version of Android dramatically outperforming a stock Android Open Source Project installation on a 3D graphics benchmark, finishing the tests well before the original version. Engineer Bernhard Rosenkränzer said in the video that much of the improvement is due to the use of a newer compiler version, as well as the aforementioned special tweaks to the OS. "Another thing is that we're using the Linaro Android system, which has been optimized a lot," he said. "Just this week, we replaced all the string operations in Bionic [a BSD-standard C library used by Android] to make sure that we get a better, faster build." He also said that, if the graphics drivers in the Texas Instruments Pandaboard test modules were open, they could have been optimized as well. The community has been quick to embrace Linaro's upgrades, with CyanogenMod -- one of the most popular modified versions of Android, designed for users of rooted devices -- already moving to integrate the Linaro tweaks in to an upcoming iteration of their software. MILWAUKEE, Wis. — The Detroit-Warren-Livonia Metropolitan Statistical Area will be one of the strongest job markets in the country in the July-through-September third quarter, according to the quarterly Employment Outlook Survey from the Milwaukee, Wis.-based temporary help firm Manpower Inc. Employers in education, health services and government plan to reduce staffing levels, while hiring in information technology is expected to remain unchanged. The other individual market Manpower tracks in Michigan, Grand Rapids-Wyoming, also showed strong numbers, though not as strong as Detroit and a bit weaker than a year ago. From July to September, 22 percent of the companies interviewed plan to hire more employees, while 4 percent expect to reduce staff. Another 70 percent expect to maintain their current workforce levels and 4 percent are not certain of their hiring plans. This yields a Net Employment Outlook of plus 18 percent. For the coming quarter in the Grand Rapids area, job prospects appear best in construction, manufacturing (both durable and non-durable goods), transportation and utilities, wholesale and retail trade, financial activities, professional and business services, education, health services, leisure and hospitality, and other services. Employers in government plan to cut staffing levels, while hiring in IT is expected to remain unchanged. In Michigan overall, 26 percent of the companies interviewed plan to hire more employees, while 5 percent expect to reduce their payrolls. Another 67 percent expect to maintain their current staff levels and 2 percent are not certain of their hiring plans. This yields a Net Employment Outlook of plus 21 percent. That’s up from plus 13 percent in the second quarter and plus 15 percent a year ago. Nationally, of the more than 18,000 employers surveyed in the United States, 21 percent expect to add to their workforces, and 6 percent expect a decline in their payrolls during the third quarter. Seventy-one percent of employers anticipate making no change to staff levels, and the remaining 2 percent of employers are undecided about their hiring plans. When seasonal variations are removed from the data, the Net Employment Outlook is plus 11 percent, similar to the second quarter 2012 Net Employment Outlook of plus 10 percent. The next Manpower Employment Outlook Survey will be released Sept. 11 to reflect hiring expectations for the fourth quarter. The Manpower Employment Outlook Survey’s United States results are based on interviews with 18,000 employers located in the 50 states, the District of Columbia and Puerto Rico, which includes the largest 100 Metropolitan Statistical Areas based on number of business establishments. The mix of industries within the survey follows the North American Industry Classification System Supersectors and is structured to be representative of the U.S. economy.